Add Visual Parsers, Monitoring, Predictive Insights, Apps! Immediate Value for ELK stack! Auto-detect: exceptions, errors, and anomalies with AI-powered technology. DevOps deployment – compare errors and detect issue after every change. 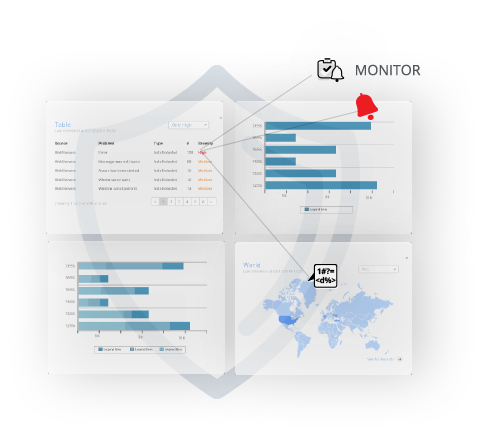 Use dozens of analytics apps and dashboards to visualize your logs – gain all the insights you need in a click (access logs, security, performance, etc.). Free live monitoring with alerts – stream events and trigger alerts. Security with XpoLog – control user access, masking, encryption, SSO. Add Visual Log Parsers, Security & Monitoring to ELK Stack in Minutes! XpoLog “plug and play” bi-directional integration with Logstash. Collect logs with agentless technology, apply parsing rules and forward to Logstash. Stream log events from Logstash to XpoLog in minutes. Simple forwarding from Logstash to XpoLog takes your team a long way. Gain immediate insights with auto parsing and visual formatting of log events. Log viewer which helps your team tail and search logs from a single point. XpoLog lowers costs and eliminates complexity – Make log management SUPER easy and effective.